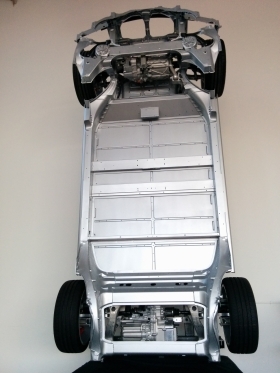 All-wheel-drive versions of the Tesla Model S will be designated "D," which stands for "dual motor." LOS ANGELES -- Tesla Motors will offer an all-wheel-drive system in its all-electric Model S sedan, CEO Elon Musk said, giving a glimpse of the first-of-its-kind powertrain that will power Tesla's Model X crossover when it goes on sale next year. Musk made the announcement Thursday at an airport hangar in Hawthorne, outside Los Angeles, as robotic arms swung the chassis of the new awd system through the air on stage. The splashy event ended a week of speculation after Musk used Twitter to say that Tesla would "unveil the D" on Oct. 9. 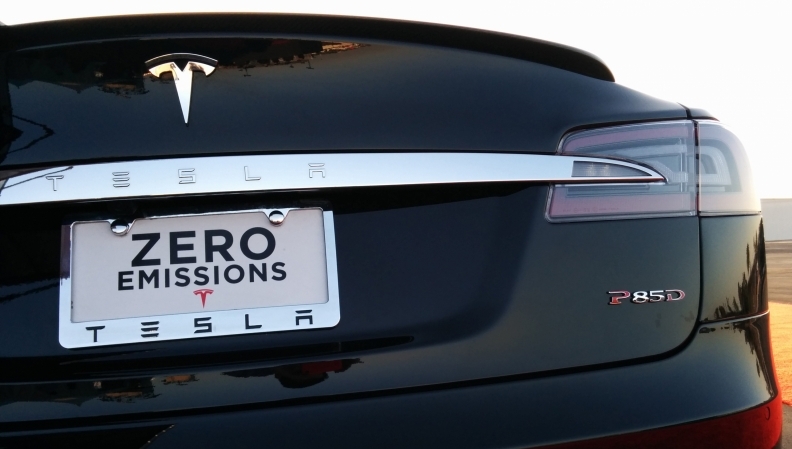 In the Model S naming conventions, the letter "D" will stand for "dual motor." Cars equipped with Tesla's new awd system will have a second electric motor mounted above the front axle to power the front wheels, joining the electric motor that sits over the rear axle in all current versions of the car. Musk said the dual-motor Model S has quicker acceleration, better grip and a longer range -- despite its added weight -- because it automatically adjusts its use of the two motors to maximize efficiency. "Literally, everything about the car improves with dual-motor," he told an audience that consisted largely of Model S owners and Tesla employees. Tesla, which hopes the added grip of the awd system will make the Model S more appealing to buyers in snowy climates, plans to offer it in all trim levels. It will be called the 60D, 85D or P85D, depending on whether the car has a 60- or 80-kilowatt-hour battery pack and whether the owner opted for the "performance pack." "I think there will be a whole class of new buyers for whom all-wheel drive is extremely important," Musk told reporters today. "They don't really care that much about performance, but they really want the all-wheel drive." Tesla said the second motor will be tuned in the P85D for faster acceleration, helping the car race from 0 to 60 mph in 3.2 seconds, compared with 4.2 seconds for the current P85. That will make it one of the fastest four-door sedans ever put in production, besting the 2015 Dodge Charger SRT Hellcat, which takes 3.7 seconds to hit 60 mph. It will be tuned in the lower-trim models for increase efficiency. Tesla promises the 60D will get 225 miles on a charge, compared with 215 miles for the base model. The 85D will also get an extra 10 miles, for a total of 295 miles. In his Twitter post, Musk said his Palo Alto, Calif.-based company planned to unveil "something else." During today's event, Musk also revealed driver-assistance systems that use cameras and radar to prevent drivers from drifting off the road or striking a car ahead of them when using cruise control. Tesla's approach offers features that the systems from its premium rivals, such as Mercedes-Benz and BMW, do not. Though drivers are legally bound to pay attention at all times, the Model S will not force them to keep their hands on the wheel, Musk said. And if the driver pushes the turn signal lever, the car will change lanes on its own. "Once we upload the software over the next two or three months," Musk told reporters, "the Model S will have the most sophisticated driver assistance or autonomous functions of any (production) car on the road." Tesla's production line started equipping the Model S with the necessary cameras and sensors about two weeks ago. Musk has positioned these sorts of features as a stepping stone to autonomous driving. "We're going to push the limit of what's safe with this level of hardware and what's allowed by regulations," Musk told the audience at today's event. Musk told reporters today that the company expects to have a "fully autonomous car" in five or six years,"with the regulators maybe taking two or three years beyond that to approve" the system. And in an update on Tesla's long-promised battery-swap program, he said that Tesla plans to open its first station, between Los Angeles and San Francisco, within the next two months.